(Nanowerk News) Researchers at the UCLA Henry Samueli School of Engineering and Applied Science and the Université Pierre et Marie Curie in Paris have identified a method for manufacturing longer-lasting and stronger forms of glass. The research could lead to more durable display screens, fiber optic cables, windows and other materials, including cement. Glasses are liquids that are cooled in the manufacturing process to reach a stable “frozen liquid” state. However, as glass ages and is exposed to temperature variations, it continues to flow or “relax,” causing it to change shape. Rendering of the molecular structure of sodium disilicate glass. Researchers have identified a way to produce glass that is more durable. This means that over time, windows and digital screens can deform, eventually becoming unusable. In the case of cement, which has a molecular structure similar to that of glass, relaxation eventually leads to cracking and, in bridges and tall buildings, a loss of structural integrity. Mathieu Bauchy, an assistant professor of civil and environmental engineering at UCLA, and Matthieu Micoulaut, a professor of materials science at the Université Pierre et Marie Curie, have identified optimal conditions for developing more durable glass and cement. 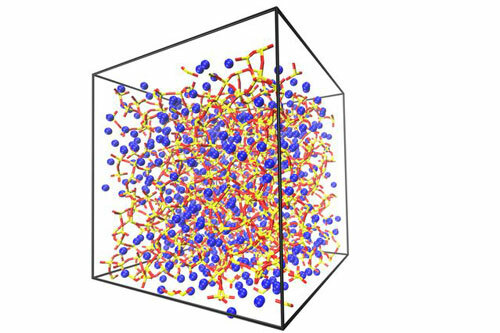 By performing computer simulations to test the molecular dynamics of materials commonly used to make glass, the researchers identified a range of pressures that are best for achieving “thermal reversibility,” in which a material will retain the same properties it had when it was produced, even if it has been exposed over time to variations in temperature. The research was published March 9 in Nature Communications ("Densified network glasses and liquids with thermodynamically reversible and structurally adaptive behaviour"). “The key finding is that if you use specific conditions to form glass — the right pressure and the right composition of the material — you can design reversible glasses that show little or no aging over time,” Bauchy said. Bauchy said the molecular structure of glass is analogous to the metal framework of the Eiffel Tower. Strength and rigidity are partially a result of the angles at which beams and crossbeams connect. The researchers’ new process improves the angles at which molecular bonds occur, making the material stronger. The research could also have a significant impact in slowing the production of greenhouse gases. The manufacture of cement and concrete results in approximately 5 percent of all greenhouse gas production, according to the American Ceramic Society. Bauchy was the lead author of the research; Micoulaut was the principal investigator.